After some soul searching, I realized that a 10-step K-beauty skin care routine just isn’t for me. So, when Milk Makeup launched their Watermelon Brightening Serum in a solid stick form, it felt like someone, somewhere had been listening to my inner monologue. As I said, I did some soul searching and came to terms with the fact that doing the bare minimum skin care at night and then laying in bed to scroll through Instagram for 45 minutes just sounded more like me, you know? Now, at night after using a gentle cleanser and a toner, I unscrew the cap of the serum and rub it onto my face in upward, semi-circular motions, then pat it a bit to help it absorb before continuing on with a hydrating serum and a retinol or vitamin C serum (depending on the day). Contrary to its name, it doesn’t have an overwhelming scent like the Instagram-famous Watermelon Glow Sleeping Mask and Watermelon Pink Juice Moisturizer from Glow Recipe, which are both Jolly Rancher-level smelly. I was pleasantly surprised there’s really no scent at all from the Milk Makeup serum; there is a nice cooling sensation, though. The main thing to get used to is the action of (more or less) rubbing a glue stick full of brightening ingredients around your face. It’s like putting on sunscreen with a stick, except there aren’t any real, immediate consequences if you miss a spot. I haven’t noticed any drastic changes yet, but it does leave my skin dewy and fresh. There have even been days where I skip my hydrating serum all together. 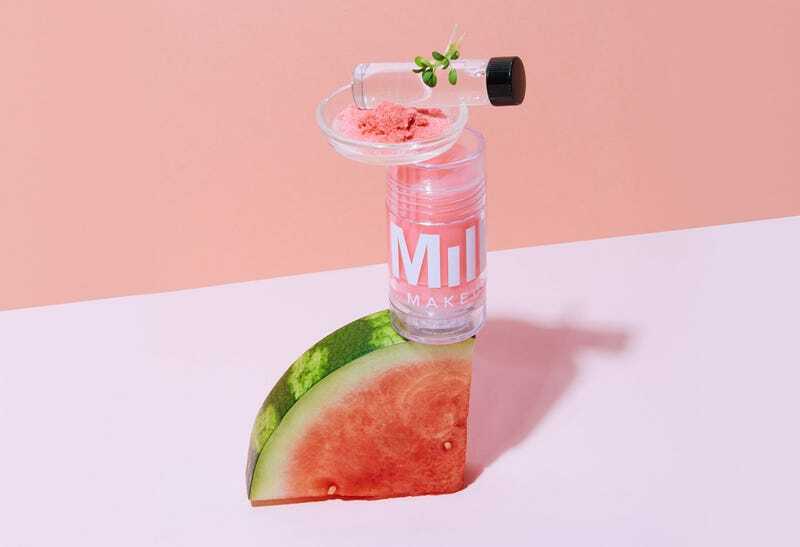 If you need a brightening serum in your routine but can’t be arsed to slather on a liquid and waiting for it to dry, the Milk Makeup Watermelon Brightening Serum is for you.